As you know, the first edition of BIG BAD IRONCLAD! had a humongous error in the endpaper. We accidentally had Kansas colored as a Confederate state. This was not something we could just sweep under the rug. The good librarians at the Lackman branch of the Johnson County Library system in Kansas, brought me out to apologize in person for this grievous error. Here are the photos of that ceremony. This is the Table of SHAME--also the Table of CORRECTION. 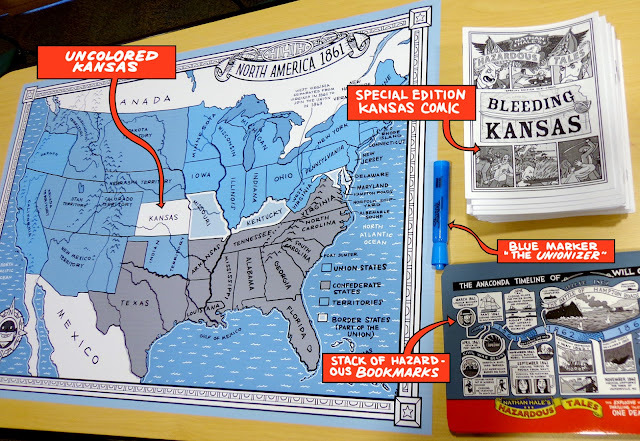 On it, there is a poster-sized version of the endpaper, with Kansas a neutral white (not the erroneous Confederate Gray), a stack of hand-bound BLEEDING KANSAS mini-comics--EXCLUSIVE to this event, a stack of the hilariously over-sized Hazardous Tales bookmarks (larger than the actual books) and our Unionizer marker. After an official statement by me (followed by a loud BOO-ing of my mistake) I gave an hour-long presentation on the Bleeding Kansas history, Lewis and Clark in Kansas, even a bit about the lone member of the Donner Party who died in Kansas--all Kansas history tales. We then moved on to the Unionizing of the map. 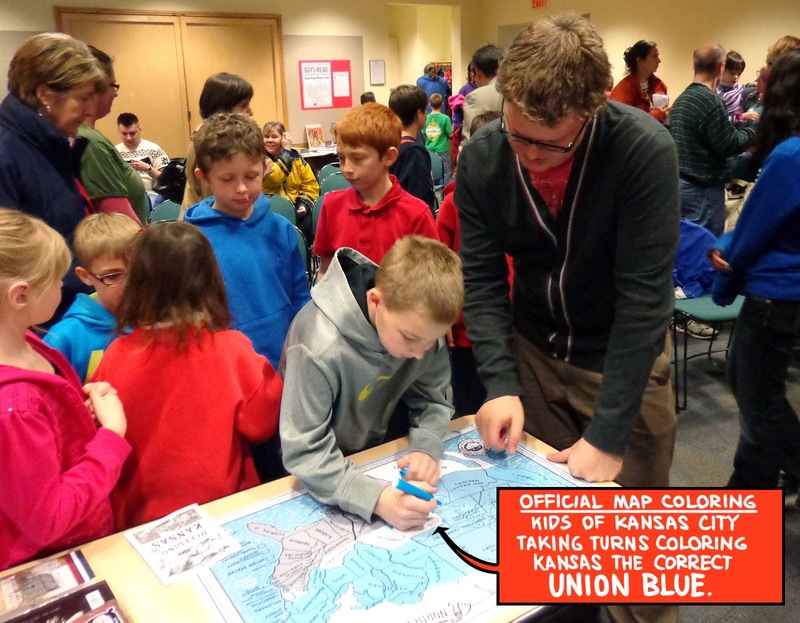 Everyone got a chance to color in a small piece of Kansas. We actually had two of these maps to accommodate everyone. 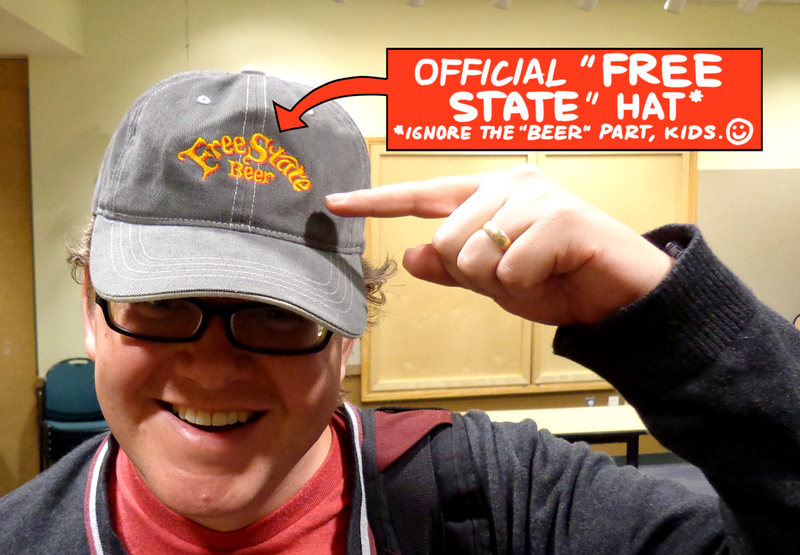 The librarians gave me an official "FREE STATE" hat to wear, to remind me that Kansas was indeed a FREE STATE. At the end we had two maps, one for the library and one for me, showing Kansas as a UNION state. We then brought the presentation to several Kansas grade schools in the area, where there was even more BOO-ing. All in all, it was a great apology tour. I think me and Kansas are square now. A big thanks to everyone who came to the events. I'd especially like to thank Chris and Barbara at the Lackman library who took care of me, and everyone involved in the set up. How fun! How do your biggest fans get a hold of one of those bookmarks? I usually have these bookmarks on hand at author appearances. I'll have them at the Provo Library Children's Book Festival on May 18th--with special guest, Ella Enchanted author, Gail Carson Levine! Boy those Kansans really know how to rub it in, don't they? Ah well, all in the name of good fun and publicity. I will put it on my calendar. Now, where's a blue marker for my book? 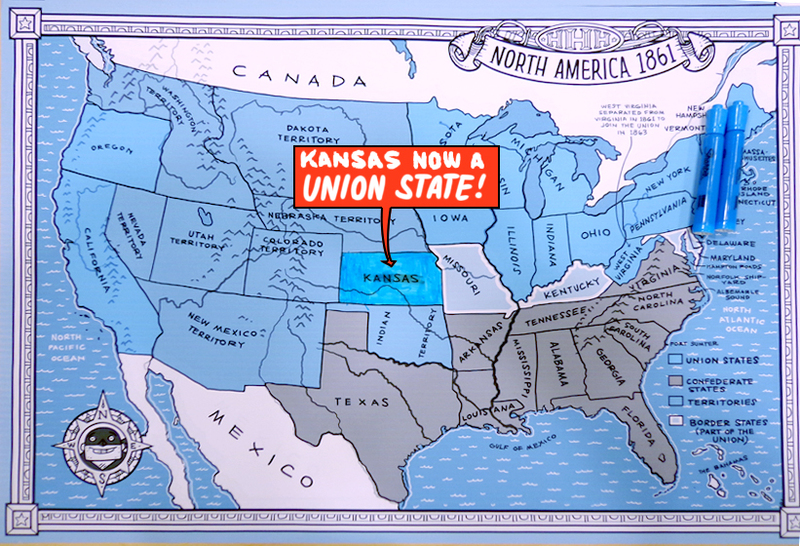 You can't fix your own copy because Kansas is GRAY in it. On the bright side. If you have a book with Confederate Kansas, you have a rare collectors item. Sure to be worth millions when Hazardous Tales breaks big!